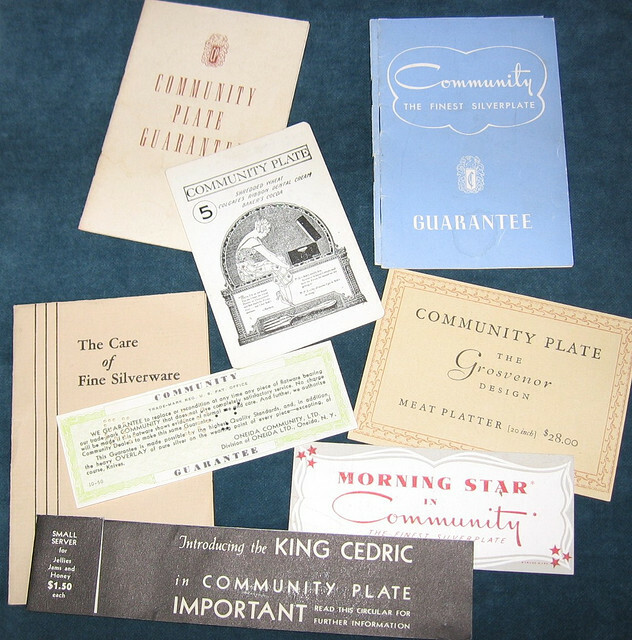 After years of looking for examples of Oneida Ltd.’s popular Community line of silverplate, I have been impressed by the variety of documentation available to collectors. Nothing is better than the product itself. 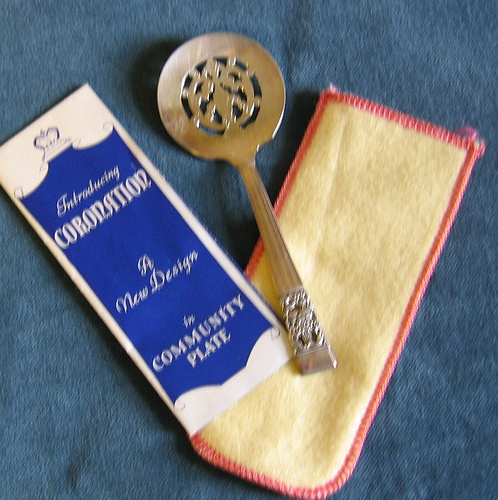 This little Coronation (1936) BonBon Server came in its own flannel case, accompanied by a neatly-folded brochure listing all the other pieces available in the pattern. This item was a give-away at the time the pattern was introduced and, since it was flat, it was easily enclosed in a sales letter. 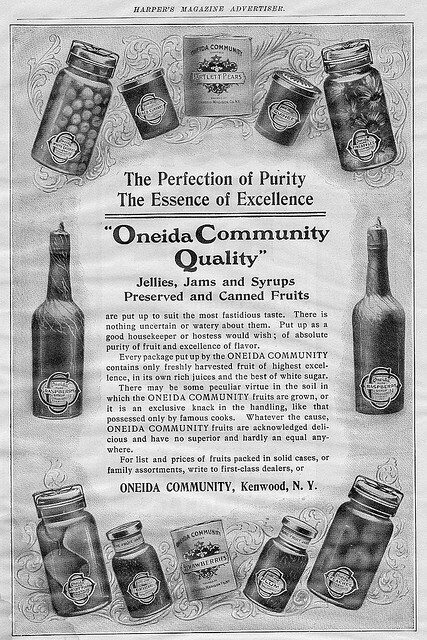 Oneida accompanied its products with a great variety of booklets, certificates and special labels. They built customer loyalty by assuring them of quality and high status. And if you wanted to buy or give silver, but were not sure what would be right, they had a booklet for that situation also. 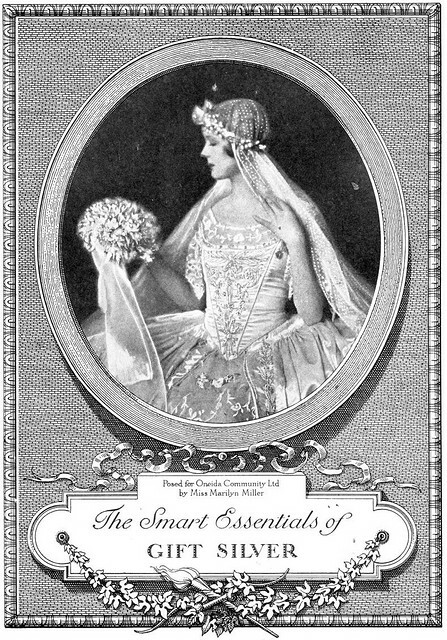 Informative catalog pages are available for many patterns. 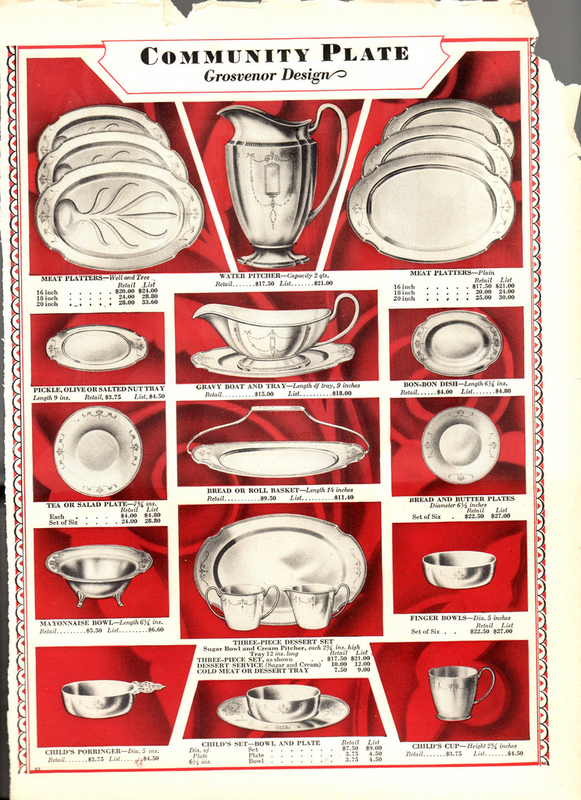 This page from a wholesaler’s catalog lists and illustrates hollowware available in the Grosvenor (1921) pattern. Advertisements are valuable. 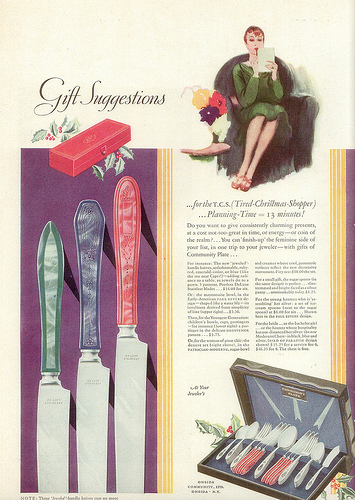 This advertisement documents the plastic-handled knives made to match Oneida patterns. Product brochures provide detailed information which may not appear in catalogs. 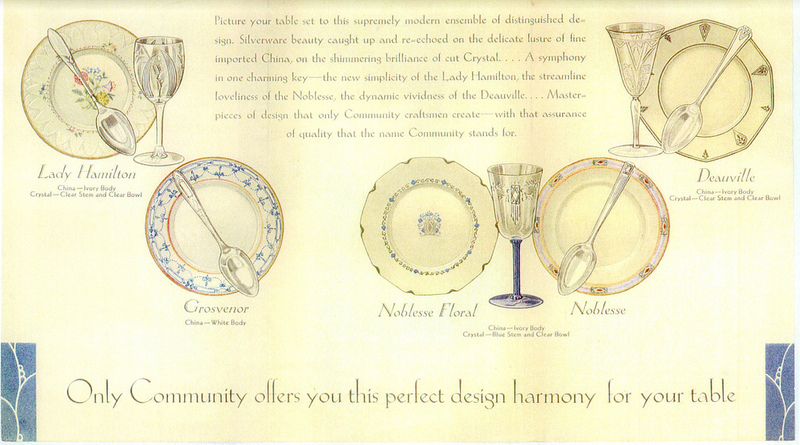 This page from the brochure shows clearly the patterns of china and crystal offered to match Oneida flatware patterns of the period. 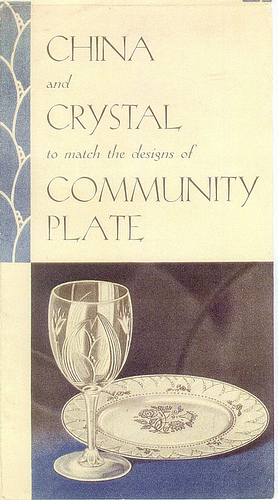 Note that no crystal is shown with the Grosvenor pattern although it had been advertised earlier. For reasons best known to Oneida (manufacturing problems?) they did not continue to market Grosvenor crystal. Just step backwards about 40 years: an earlier ad shows how far the sophisticated silver company had come from its origins as a purveyor of jams, jellies and syrups. Post cards also provide images from the past. This one shows the administrative headquarters of the Canadian branch of Oneida. And here is a bonus. 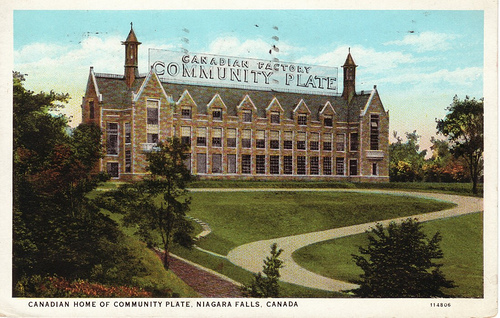 Pierrepont Noyes, a son of John Humphrey Noyes, was instrumental in the development of Oneida Ltd., including introduction of the Community Plate line. I purchased a copy of his novel, The Pallid Giant. It must have been a presentation copy from Noyes. 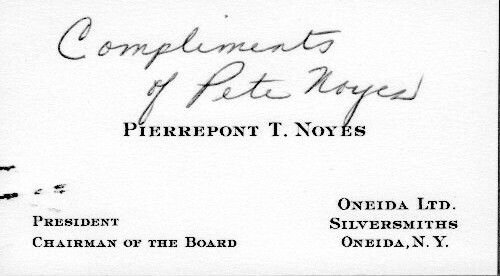 Tucked inside the front cover was this business card with Noyes’ signature. To see more examples of Oneida documentation, check out my American Silver Booklets.